Colour-coated aluminium profile with drip edge. Profile is installed over a finished sloped screed and features perforated edge protection for the tile or stone installed above. Colour-coated aluminium profile with drip edge. Profile is installed over a finished sloped screed and features solid edge protection for the tile or stone installed above. Colour-coated aluminium profile with drip edge. Profile is installed into the mortar bed and acts as a guide to screed to the correct height. Stainless steel or colour coated aluminium cover profile for exposed screed edges. Clipped onto carrier profile Schlüter-BARA-RW to provide complete protection for the balcony assembly. Colour-coated aluminium T-shaped profile for finishing the exposed perimeters of balconies and terraces. Colour-coated aluminium T-shaped profile with protruding drip edge. Profile is installed into the mortar bed and acts as a guide to screed to the correct height. Colour-coated aluminium T-shaped profile with protruding drip edge. Profile is installed over a finished sloped screed and features solid edge protection for floor coatings installed above. Colour-coated aluminium T-shaped profile with protruding drip edge. Profile is installed over a finished sloped screed and features solid edge protection for the tile or stone installed above. Colour-coated aluminium T-shaped profile with protruding drip edge. Profile is installed over a finished sloped screed and features perforated edge protection for the tile or stone installed above. Colour-coated aluminium T-Shaped finishing profile with protruding drip edge. Profile is installed above a waterproofing layer and features drainage holes to ensure effective exit of water. 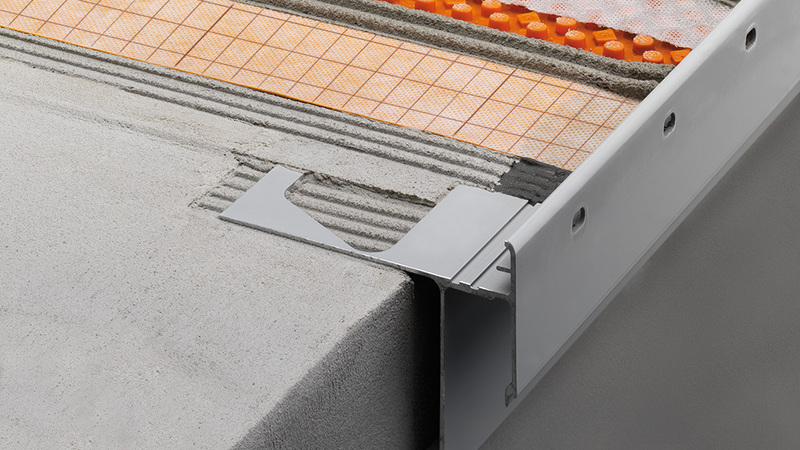 Colour-coated aluminium angled edge profile with drip edge and chamber for attachment of the Schlüter-BARIN gutter system. For large format pavers loose laid on gravel layers or pedestal assemblies. Profile is installed below a waterproofing layer and features drainage holes to ensure effective exit of water. Colour-coated aluminium T-shaped profile with drip edge. Profile is installed over a finished sloped screed and features solid folded edge protection for the tile and stone installed above. Colour-coated aluminium profile with drip edge and chamber for attachment of the Schlüter-BARIN gutter system. Profile is installed over a finished sloped screed and allows for the installation of tiles with an overhang. Colour-coated aluminium profile with drip edge and chamber for attachment of the Schlüter-BARIN gutter system. Profile is installed over a finished sloped screed and features perforated edge protection for the tile or stone installed above. Colour-coated aluminium profile with drip edge and chamber for attachment of the Schlüter-BARIN gutter system. Profile is installed over a finished sloped screed and features solid edge protection for the tile or stone installed above. Retrofit colour-coated aluminium profile with chamber for attachment of the Schlüter-BARIN gutter system. Stainless steel or colour coated aluminium profile for finishing the exposed perimeters of balconies and terraces. Can be used in conjunction with covering profile Schlüter-BARA-RAP to provide complete protection for the balcony assembly. Colour-coated aluminium L-shaped finishing profile for large format pavers loose laid on gravel layers or pedestal assemblies. Profile is installed above a waterproofing layer and features drainage holes to ensure effective exit of water. Stainless steel skirting support profile for use in applications where there is no load bearing substrate available for the skirting tiles. Colour-coated aluminium profile for covering the front edges of cantilevered balconies. Can be adhered with adhesive Schlüter-KERDI-FIX or attached mechanically. Adhesive polyethylene tape used to create an adhesive flange for waterproof connections between bonded waterproofing assembly Schlüter-KERDI and the edge of profile Schlüter-BARA-RKL. Colour-coated aluminium gutter system for the drainage of balconies and terraces. Can be attached to matching Schlüter-BARA profiles for a co-ordinated finish.